Or as N.Telsa’s own (presumably roughly translated) bio obtusely yet accurately puts it – “Exclamation mark! Suspension points…In 2008, the first (but not the final) line-up of this space circus had emerged in the town of Rostok, Germany. The project remained idle for a couple of years. Finally, in 2011 the fans of condensed milk-like oozing music met each other in the town of Oryol, Russia to share it from heart to heart and fill the collective consciousness”. Post metal, there it is. In the very first couple of words of the review proper. One of those musical identifiers I have previously been guilty of dismissively referring to as “arbitrary tags”. The generic identifier is out there early, it may be laziness, surrender to the path of least resistance or possibly my perspective on such classifications has changed now I am attempting to articulate experiences such as listening to ‘Lux Manifesto’. Consider it my attempt to provide some recognizable indication of orientation for the excursion into the tantalizingly unfamiliar musical unknown ahead. The first taste of the album is, for me, a very positive start. I am a sucker for an ominous intro and the short instrumental opener is a perfect primer as it pulls me willingly into its foreign waters. The foreboding strains that ring from the speakers are like a portentous precursor to unavoidable but completely consensual doom – the zephyr that threatens to grow into a powerful storm. The ambient wailing guitar is soon joined by polyrhythmic drumming that is both underpinning and standing out among the combination of sounds that build onto each other to loom like a menacing beacon marking the way of the journey ahead. It is an encouraging beginning and a strong indicator that it is going to be my kind of thing, in fact it is not long before the watery imagery begins to flow like… well water. This initial taste of ‘Lux Manifesto’ is akin to seeing the shimmery waters of an unfamiliar beach, inviting despite ignorance as to what they truly hold beneath. It is an enticing yet alien environment, comprised of familiar components that conspire to create something unique. The intro is promising enough for me to eagerly stride into the liquid environs evoked in my mind by the sounds of N.Telsa – to open my arms and to lay back into swell. This is music to immerse yourself in, to lilt on its tides, to submit to the will of the experience. Not to attempt navigation but rather to ride the ebb and flow, let the waves crash over and to feel the force in its full glory. N.Telsa soon provide a taste of the power they possess. First “real” track ‘North.Spring.Aurora’ comes in like a tsunami compared to the relative gentle ambiance of the intro. It picks me up onto its crest before plunging into the choppy waters that represent the majority of the remaining album. Many recognizable traits of the post-metal sub-genre are present early – the vocal delivery, the ebb & flow that comes with refusing to adhere to linear song structure, the crushing waves of densely layered compositions that randomly alternate between pummeling and atmospheric. I don’t consider such recognition of familiar elements as condemnation, every artist’s output is bound to be colored by their input. In heavier music in particular it is easy to cast accusations of derivation and lack of originality – almost every “new” sound owes something identifiably traced to its predecessors. It is inevitable that for any innovation there will be imitation. I personally respect music that can be traced to its impetus without sounding like a regurgitation of its influences. In this regard ‘Lux Manifesto’ is a success – a work consisting of common core components, but personal and unique in its construction. The depth in the composition of the songs on this album is a highlight and I was impressed by the manner in which the band have structured each piece. Particularly impressive in a debut is the maturity shown to resist the unnecessary, a few pieces include minor excesses (there is a couple of lead breaks featured) but for the most part the work intelligently encompasses unpredictable structures – there’s sprawling expanses of stripped back ambiance flowing into surges of power that suddenly rise and are prone to recede as quickly. Despite the average length of the tracks being around five minutes they manage to feel tight and compact as N.Telsa show an admirable ability to give their ideas just the correct amount of space within the songs. The changes that are sprinkled through every song are expertly executed to provide the right balance of variety and accessibility. There aren’t too many jolts to the flow of the song, yet each and every track has several divergent concepts crammed within its confines. Instead of forced or disjointed these changes mostly feel like natural alterations to the course, imperative to the musical narrative presented within each number. There are moments that will catch you off guard but they almost always align with the arc of the songs perfectly. There’s an instantly obvious confidence in their own abilities on display throughout – they don’t feel the need to show off – when the song calls for a straight forward riff, simple chord progression, pared back drum beat, singular ringing note or sparse harmonic the band obliges. They do take the opportunity to display their considerable chops occasionally – as in the jazzy bass run present in album highlight ‘Characters Drawn In Taupe’ which is slightly reminiscent of ‘Intronaut’ with its driving riff, cutting bass sound, chugging drum beat and bludgeoning vocals or the head turning moments such as the brilliant sprawling track ‘Determination Of Giants’. The songs are layered and often build into dense convergences of divergent sounds and ideas, but N.Telsa resist the urge to overplay or saturate the songs. The use of effects on all major instruments is brilliantly applied and facets such as the deft use of keyboards, loops or other electronic elements always enhance the offerings and rarely distract from or diminish them. 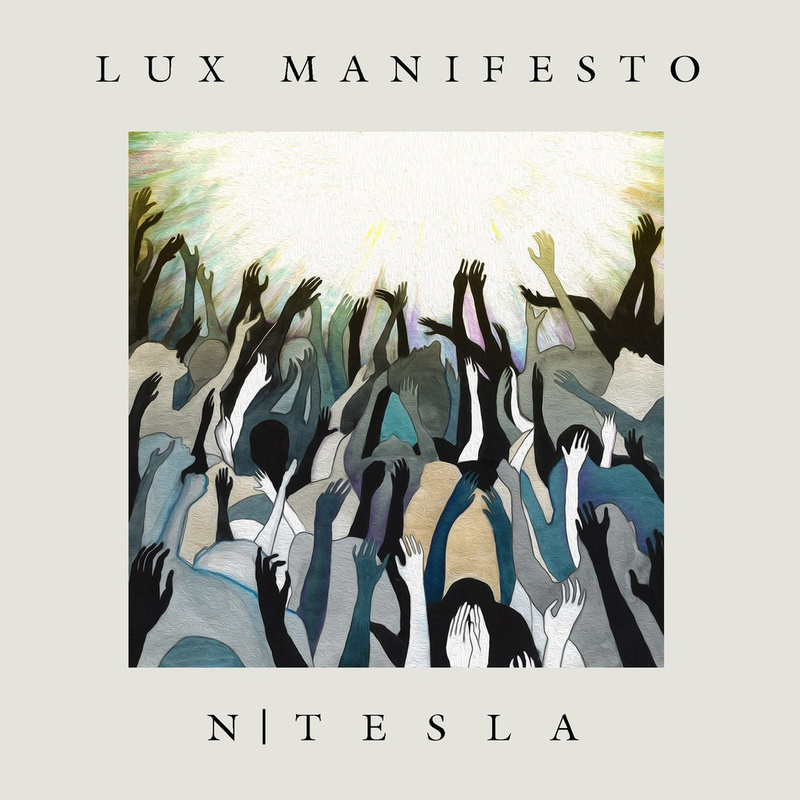 The variety of guitar and bass tones employed also help keep Lux Manifesto fresh throughout. I particularly enjoyed the vocals, whilst not offering anything ground breaking and rarely showing range beyond the impressive & intimidating roar the singer favors (precious little clean vocal on the album – which suits me just fine) the addition of effects and the occasional layering serve to provide enough variation. That same level of variety is found from track to track in several forms – each song sounds different from the previous one whilst still representing a component of a complete and cohesive work. That’s not to say there are no jarring surprises here – penultimate track ‘Megadolon’ is an absolute mindfuck of a song. It is comprised of horrific tortured vocals wailing for reasons not readily apparent. It is the kind of sound I imagine would emanate from the basement of an Al Jourgensen/Rob Zombie/Glenn Benton share house. It is definitely unnerving and possibly unnecessary, one of those songs that would be much more fun to record than to listen to, it’s fair to say I will skip this one more often than not and it absolutely should not be the song of choice for early morning come downs. The following final track is however a fitting finale – fluid in construction and execution before building to a crescendo of gang vocals and eventually fading once more into the shadowy depths. The album is extremely impressive and holds up to repeated dips. After the initial apprehensive and exciting wade into their waters the urge to revisit them is immediate and strong. The ceaseless push and pull of their irrepressible tides proved extremely enjoyable and I am sure to repeatedly submit myself to the will and whim of the deceptively deep vortex within the aural embodiment of the N.Telsa aquatic abyss.